Annie Merle Music is a music publishing company I started years ago to handle the songs that I write and co-write. In the world of song writing, business works like this: Every time a song is recorded or sheet music for it is printed, the company that records or prints that song is required by law to pay a fee. That fee is paid to the publishing company that owns the copyright for the song. The fee is split 50/50 between the publishing company and the writer(s). This whole arrangement can get more detailed, but in general, that is how it works. That is why I started my own publishing company. I don’t own every song I have ever written, but I own my portion of many of them. I named the company after my mother, Annie Merle, who lives in Mobile, Alabama and absolutely deserves the title Best Mother of All Time. If you like to know the story behind the song, check out Bev’s Music. If you would like to license one of these songs, please contact Melissa Wald at Copyright Solutions. Most of these songs are available in print, too. If you are interested in buying sheet music for a song, search halleonard.com or SheetMusicPlus for individual titles. 2005 presented a new opportunity for me, and one I never could have anticipated. As the Executive Director of Chartwell Literary Group, I manage and create book projects, from research to finished manuscripts. 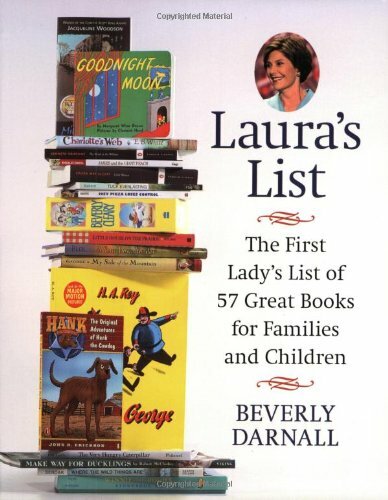 After being made aware of First Lady Laura Bush’s recommended reading list, a public list available on her website, I created a proposal for a book based on that list and presented it to Penguin Publishers in New York City. They liked the idea and wanted to publish it in seven months, and they decided that I should be the author. I dove in and read all 57 books and wrote a chapter on each one, including summaries,excerpts and reading guides that outline the themes and suggest discussion questions. It was a challenge, but a great deal of fun, and certainly a satisfying accomplishment. I am hoping the book is encouraging to parents, teachers and grandparents everywhere. I love to read emails like this one I recently received: "[Laura's List] is lovely and helpful. I purchase books for my grandchildren and like a book like this to help with suggestions as to which books to buy. I plan to buy a copy of your book for me and one for each of our children." Laura’s List is available on most major online book sites. Including Amazon. If you get a chance to take a look at Laura’s List, let me know. I am having so much fun talking to parents and grandparents about the fantastic benefits of sharing books with children, and I always love hearing from readers.